When PET imaging information changed the treatment plan, patients were able to avoid biopsies 70% of the time. Data from several recent studies show that being able to use PET scans for staging and diagnosing a wide spectrum of cancers provides a clearer indication about how to best help patients. Additionally, it can also help predict their outcomes and survival. The evaluation of PET technology has been the subject of intense interest in the medical community, particularly concerning its potential role for treating cancer patients. Large prospective studies have been initiated in the United States to establish data on the role of PET in patients with various cancers. For the past five years, similar studies have also been conducted in Australia as part of a comprehensive analysis of PET’s role in more than 30,000 consecutive patients undergoing scans. These data are currently being evaluated as part of a technology and funding review to justify PET scans being more widely available to cancer patients. Anthony F. Shields, MD, PhD, of Detroit’s Karmanos Cancer Center, cochairs the National Oncologic PET Registry (NOPR) working group, which was formed at the request of the Centers for Medicare & Medicaid Services (CMS). The NOPR is sponsored by the Academy of Molecular Imaging and managed by the American College of Radiology (ACR) and the ACR Imaging Network. The NOPR is working with the CMS to look at PET’s utility for cancers not previously approved for reimbursement by examining pre- and post-PET treatment plans. With CMS approval and within the study parameters, medical patients could be scanned for any cancer under the NOPR rubric. The stipulation was that the referring physician filled out a form detailing the treatment plan prior to the PET scan and afterward completed a second form based on the information from the scan as to whether the treatment plan had changed and, if so, how. Compliance was ensured by the fact that both forms had to be completed to receive reimbursement for the PET scan. “They can’t submit the bill without submitting the second post-PET form, and you can’t get approval to perform the PET until the first form is completed,” says Shields. Roughly 90% of participating patients gave consent to allow the NOPR to look at the data. The NOPR analyzed the results to see how treatment plans were changed as a result of the information acquired through the PET scan. Since the registry commenced in 2006, the NOPR has data from more than 100,000 patients. “There are about 200 patients a day enrolled in the study, representing patients from all the states at most PET centers across the country,” says Shields. The data detailed the impact for diagnoses, staging, and restaging with a large group including all cancers and found that treatment plans changed for about 36% of patients after their referring physicians considered the PET results. “There was a big difference in what they planned to do for patients,” says Shields. He mentions that there is also currently a study that reports on the results broken down by individual cancers (eg, segmenting prostate, colon, ovarian) and examines the changes in treatment plans by cancer. “We’ve found it really didn’t differ statistically among cancers. Treatment plan changes didn’t seem to be cancer specific but remained consistent with our findings for cancers in general,” he says. Researchers reviewed results for monitoring the therapy for cancer patients already in treatment and found that those in treatment also had similar changes to their care plans. “We thought the data was helpful in helping physicians use PET in routine clinical care,” says Shields. One major finding shows that when PET imaging information changed the treatment plan, patients were able to avoid biopsies 70% of the time with the revised treatment plans. In addition, compared with the pre-PET treatment plan, they found a three-fold increase of plans that led to treatment vs. nontreatment because more lesions were visible with PET. While the NOPR study compares initial and post-PET treatment plans, it did not explore whether the referring physician followed through on the treatment. But Shields believes it is possible to study the actual course of treatment by taking a look at Medicare records to see how the patients were eventually treated. “PET is not perfect, but it will pick up lesions not found by other modalities. Even with its limits, physicians are trained to use PET to its maximum advantage,” Shields says. The working group presented its voluminous data to the CMS, with a panel reviewing the information. “CMS has until January to modify regulations based on the new information from NOPR and other relevant manuscripts, and it is our hope that they will expand their coverage and no longer do determination for PET use cancer by cancer,” says Shields. Andrew M. Scott, MD, of the Centre for PET at Austin Hospital and the Ludwig Institute for Cancer Research at Austin Hospital in Melbourne, Australia, was the lead investigator of a recent study published in the Journal of Nuclear Medicine focusing on the effects PET scans had in changing treatment plans for patients with colorectal cancer. “It is the first large, prospective, multicenter study conducted to date exploring the role of PET in patients with suspected recurrent colorectal cancer,” says Scott. A total of 191 patients recruited from four PET centers around Australia were evaluated for analysis in the study. According to the results, PET identified more disease or absence of disease than conventional staging. When comparing treatment plans before and after the PET scan, there was a significant change in the management of more than 50% of patients. The study also shows that PET scan results were better than conventional staging at predicting whether patients had a better or worse prognosis after treatment. “These results show that PET has a significant role in determining appropriate management in patients with suspected recurrent colorectal cancer and that these patients should have PET scans as part of their treatment workup,” says Scott. Similar to the U.S. NOPR study, the Australian PET data collection project was intended to show the impact of PET for managing cancer patients and to provide evidence supporting increased coverage for the use of PET in patients with many different types of cancer. “The information obtained in this study is directly relevant to patients wherever they may be, as the standard of care in Australia is equivalent to that in the U.S., Europe, and other developed countries. We want to be able to inform treating clinicians regarding the most effective treatment for their patients. Sometimes it involves recommending a particular treatment modality, and other times it shows that major treatment or surgeries might not be appropriate for a certain patient, thus avoiding costly procedures and the pain involved with such treatments,” Scott adds. Homer A. Macapinlac, MD, chair of the department of nuclear medicine at the University of Texas M. D. Anderson Cancer Center in Houston, is also the president of the Society of Nuclear Medicine’s PET Center of Excellence. The center is a component within the society that is dedicated to all aspects of the development and utilization of PET and PET/CT in the detection and management of disease. Macapinlac views Scott’s study as valuable because it is a large, prospective study combining cases from academic centers, as well as private imaging centers, and focuses on the accuracy of PET for predicting patient outcomes. While the NOPR data showed the efficacy of PET for adopting appropriate treatment plans, Scott’s data revealed its key benefit: predicting outcomes and survival. “The study found that the PET scan reflects the reality of what would happen to the patients. Very few modalities can predict outcomes. If you suspect a patient has recurrent colon cancer, I believe it is best to do a PET/CT first to assess the extent of the disease,” says Macapinlac. PET has the ability to show whether the disease is systemic, which could help doctors and patients make decisions about treating aggressively or not undergoing procedures that may offer little or no benefit in light of their prognosis. Through the PET Center of Excellence, Macapinlac hopes to offer a way of shifting the paradigm of how patients are assessed. He says PET has the capability to show a physician the biology of a patient’s disease, and by being able to determine up front whether the disease is localized or systemic, the appropriate therapy can then be applied and affect the patient’s outcome. “If you find it is localized, you can choose an appropriate therapy; if you find it is systemic, you might need to treat the patient more aggressively. The ability to predict the outcome is a strong measure of survival and is evidence based,” says Macapinlac. As part of the largest ACR-accredited PET facility in the country, Macapinlac believes it is important to try to provide the same care for patients in community hospitals and small imaging centers. 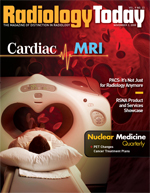 “The value of imaging is not just doing the imaging for every patient that comes along but to decide the proper therapy and proper monitoring in a cost-effective fashion. PET is a wonderful tool because it can predict survival and allows us to find the extent of the disease. It is a whole body imaging tool and allows for a systemic approach to treatment that allows physicians to assess the patient and stage them accordingly,” says Macapinlac. “Our task, instead of using PET as a problem-solving tool, is to use it as a triage tool to direct the next step in identifying whether the disease should be treated with localized therapies, systemic therapies, or a combination of both. It will be more effective then. If we do the imaging up front to assess the disease, it will make a big difference for the patient,” he adds.